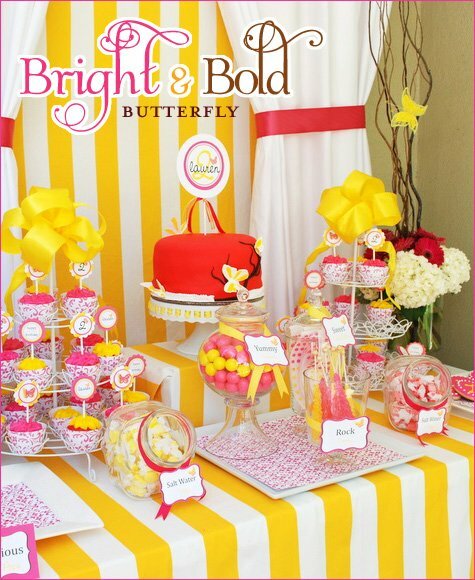 Rebekah from A Blissful Nest created this cheerful “Bright and Bold Butterfly” party to celebrate her daughter Lauren’s 2nd birthday. 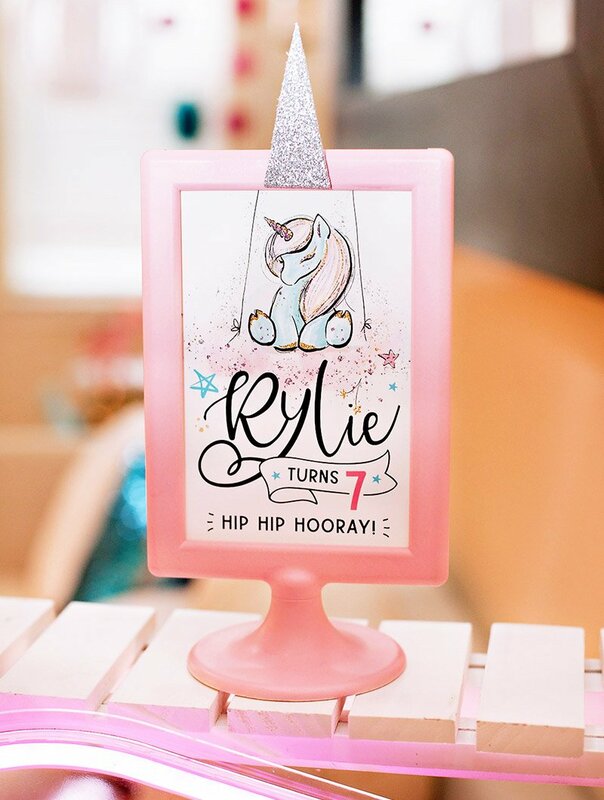 And speaking of the birthday girl… how adorable & stylish is she?! 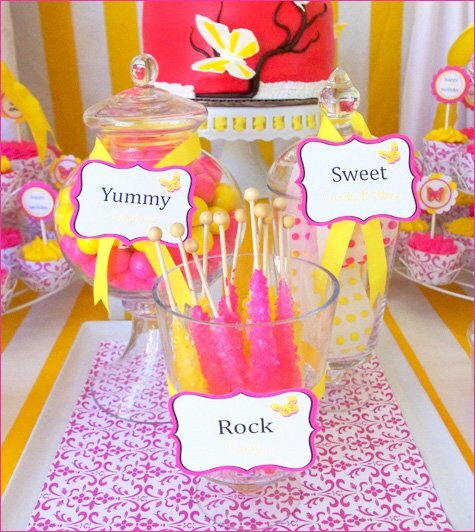 This hot pink & yellow color palette feels so fun and “happy“! 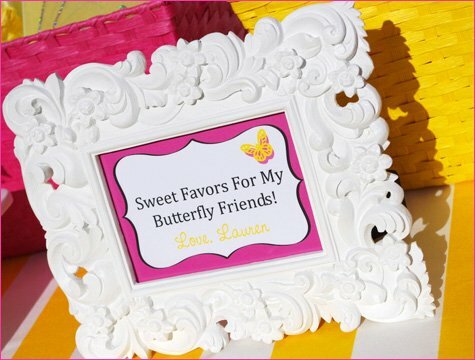 In addition to the fabulous dessert table, other creative details included a homemade hot pink door wreath, patterned paper pinwheels, butterfly accents in the flowers, and a whimsical favor table featuring butterfly wings and butterfly catchers for the girls! 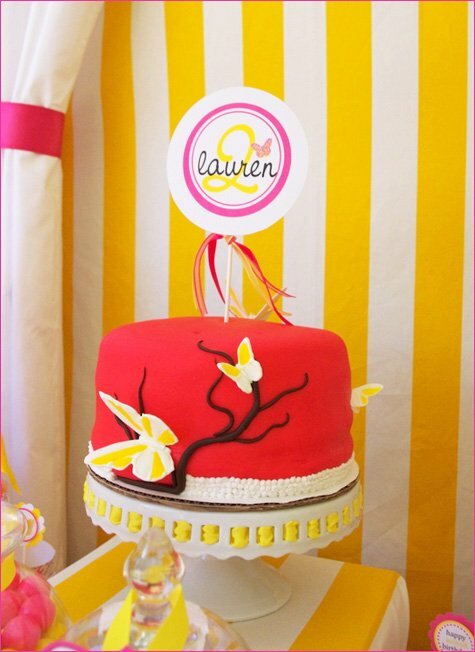 “Lauren is obsessed with butterflies right now, so we picked this theme for her birthday. We chose the colors hot pink and yellow because she also loves yellow and I thought the combination of the colors was bright, bold, and cheerful. 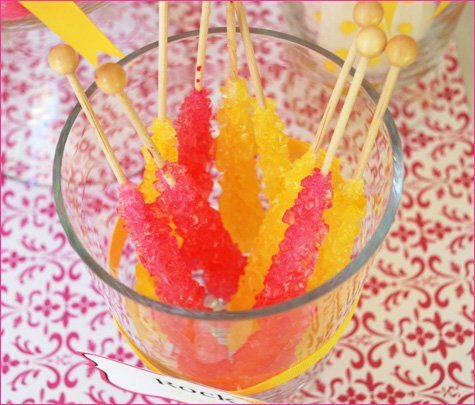 They are so vibrant and were perfect for an end-of-the-summer bash! Being inspired by the silhouette trend right now, I took it a step further by layering it with a contrast butterfly that you could see through. I love the layered effect and how it makes the butterfly pop! 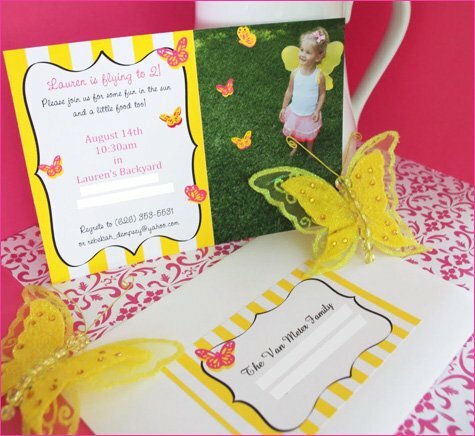 The invitation was bright and bold with these cute little layered butterflies flying around Lauren’s head. 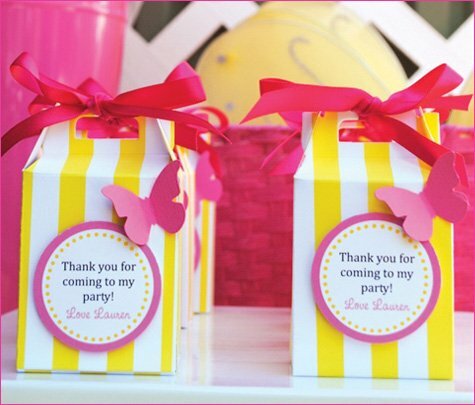 I carried the signature colors and a bold yellow wide stripe pattern throughout all the paper products – from the cupcake toppers and adorable favor boxes to the fabrics on the dessert and favor tables. The amazing cake – made by Esmeralda of Sin City Sweets – took center stage on the table. She also made lemon cake cupcakes with raspberry fill crowned with hot pink and yellow icing. 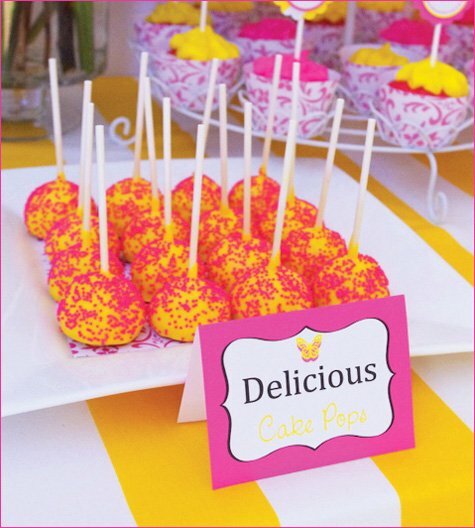 Esmeralda also made the most delicious cake pops that were gone in seconds! For the sugar lovers there was rock candy, sugar buttons, and gumballs served in apothecary jars on a platter. 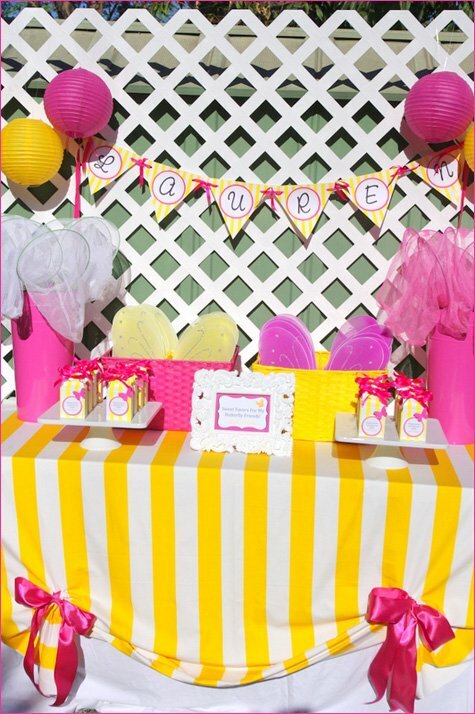 The dessert table and favor table were draped with a wide yellow stripe fabric and tied with hot pink bows. 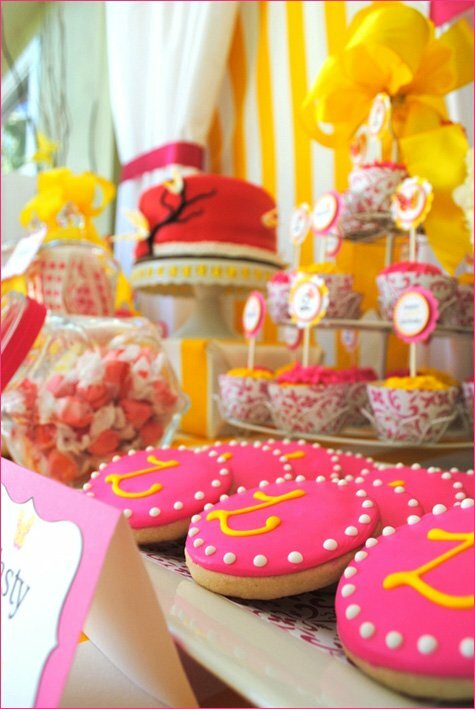 I thought it fitting to have white drapes tied back with hot pink ribbon for behind the dessert table – perfect for the sweet butterflies! All the kids were given butterfly wings and butterfly catchers to dress up and play with… Little butterfly crayons were in matching yellow striped boxes for them to take home. They all looked so cute running around with their wings on, and it was a great way to spend a summer afternoon! 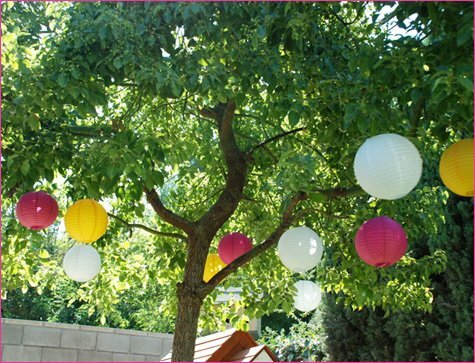 Paper lanterns were hung from the trees and matching pinwheels were placed throughout the garden. Lauren’s birthday present even was decorated to match! 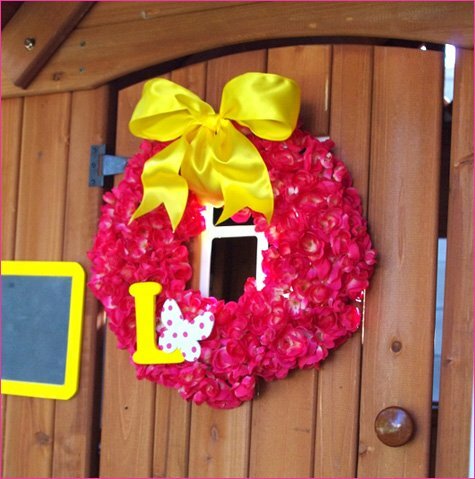 I made a hot pink floral wreath and painted her initial with a butterfly for the side of it. The chalk board frame was painted yellow and hangs next to her door so mommy and daddy can write little notes to her. Love how vibrant the color scheme is. Love the details! Love these colors! How sweet this girl is! Great idea! 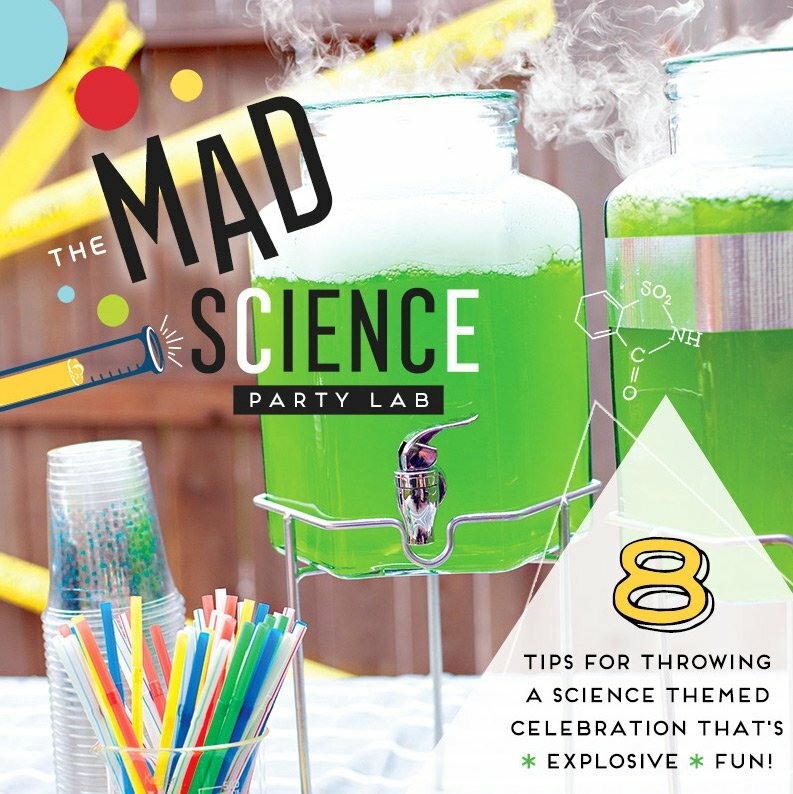 I’ve been seeing a lot of yellow parties lately, and this is definitely a standout! I really love the combination of stripes with the damask! 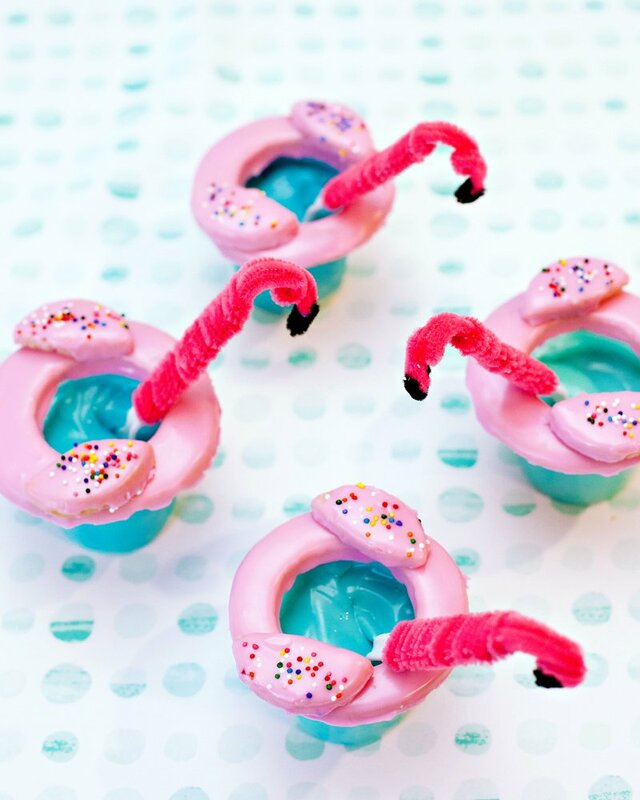 Adorable party!! 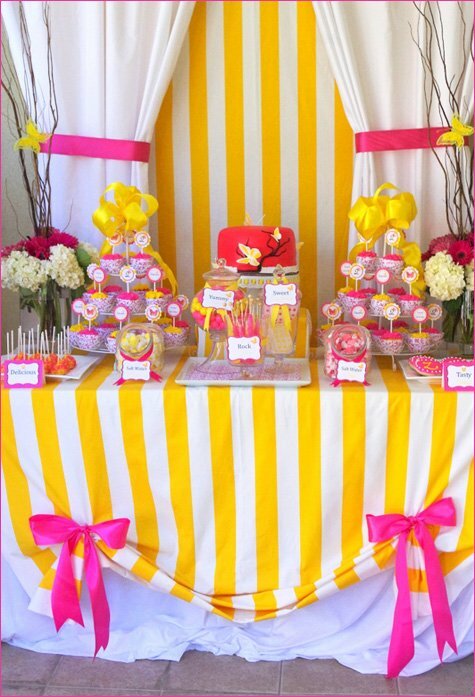 Any idea where the yellow stripe table cloth I’ve been looking for something like that for my daughters birthday party??? 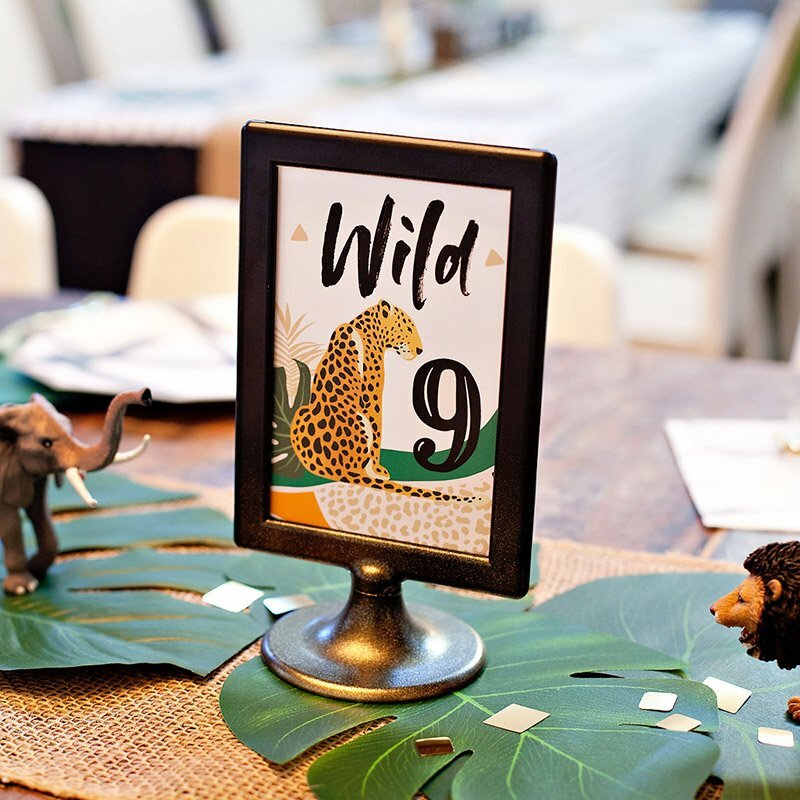 I love this party idea and am going to try to re-create it for my daughters 1st birthday party. I just went to Ikea and the yellow stripe fabric has been discontinued. If anyone else knows where i can find this fabric or something similar please share. Also, I am open to other ideas for table clothes for this butterfly party. WOW! I love LOVE the bold yellow & white stripe backdrop and tablecloth. It looks amazing! This party is so ridiculously cute! I love it! She looks like a very happy birthday girl! Love this party!! I love yellow in any party. [email protected], must you pimp your blog in every comments section? It’s more than a little annoying. Thank you everyone for the sweetest comments!! Rhi the stripe fabric is from Ikea. thank you so much for the tip!! I can’t get over how CUTE all the details are, great job!! So cute and her Etsy shop is amazing as well. She even has DIY printables for Halloween! I am in LOVE with the yellow/white bold striped table cloth. AMAZING! The colors in this party make me want to have a party just like this!! 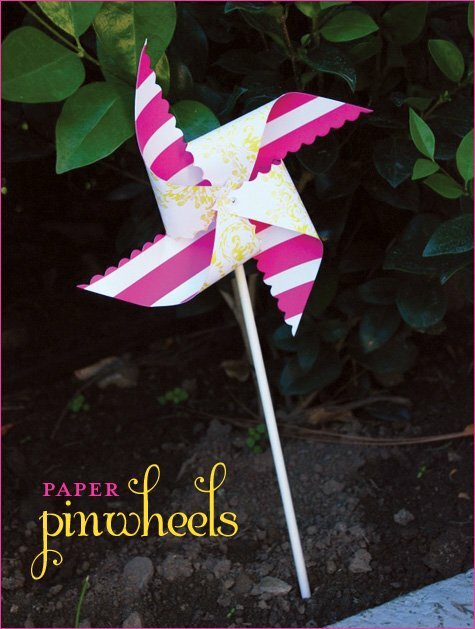 Oh, and Shana from Crossroads Cottage makes the most beautiful pinwheels.. LOVE THOSE! Love the idea of this party. The tags with the kids names on them make it so personal & special. I think it’s such a great idea to have such a varitey of treats & the tags make it that much more wonderful! The flower wreath is beautiful. Rebekah was a pure pleasure to work with on this party. So fun to see how bright and cheery it turned out. 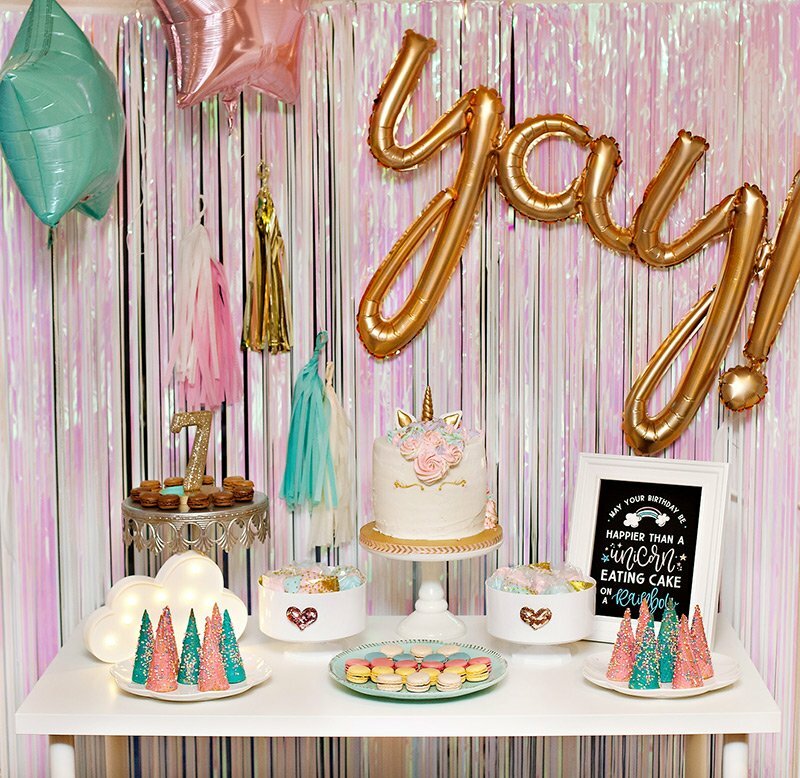 Makes me want to throw a party just like this – sadly, I don’t have a little girl. Maybe I’ll have to throw a big girl party with this theme. I love the stripe backdrop and tablecloth! Also, the pink and white butterfly nets are adorable. What a fun party! What an aaaamazing party!! I love it!! This is truly lovely, but what I really want to know is where did the cake plate come from. I’m sure I’ve seen it before, but seeing it in the beautiful setting – I need to have it! Amanda- the cake plate is from Homegoods and then I just threaded coordinating ribbon through it. I love this one because I can change the ribbon for every party. Take care! Love! The butterflies, bright color palette and the beautiful cake…love, love, love! That is HEAVEN! Just gorgeous!! Love the vibrant bright colors. They really stand out. The treat table looks fabulous and yummy! I would also LOVE to know where the tablecloth/fabric came from!!! The photos themselves are eye candy! I love visiting this blog just to treat my eyes to the colors! I wish I still had a little girl. What a great idea! I just saw your post about Ikea! Don’t know how I missed that! Thanks! I want this to be my party! And I am turning 29 again! I love the colors in here! It is so bright and just says a lively and fun day. Thanks for sharing! where did you get those picture frames? So cute!!!! 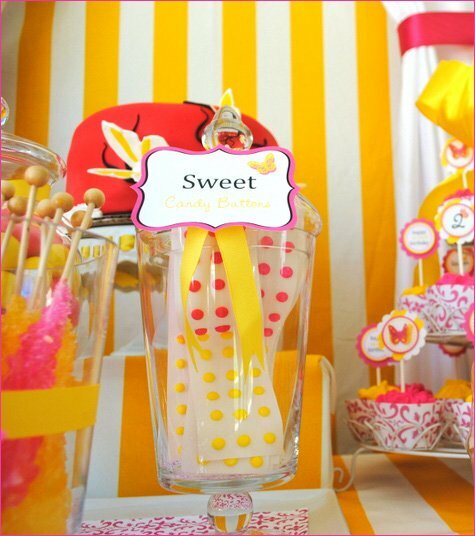 I’m planning a Bumble Bee Party… White, Hot Pink and Yellow… I love how the colors were combined. Gorgeous! There is just absolutely NO way a party this beautifully planned and decorated cannot be a success. Brava! What an awesome party! I love seeing all the ideas out there! I think it’s fine for others to share their ideas and blogs, that is how we all learn and gather inspiration! Thank you, Liz! Your kindness is so appreciative. Becks, I apologize if my link offended you or others. I enjoy when other people link appropriate content on my blog and that’s all I was trying to do. Rebekah, this party really is stunning! I keep coming back to it for ideas and inspritation! Beautiful! I love the color combo and all the perfect details! Is that girl black or white? I can’t tell. Can you please tell me how much fabric you bought for the tables and the wall? Did you buy the Fabric at Joann and was it by Robert Allen Sandhaven? I found the fabric at Ikea in the textiles department, it’s available in stores only and I had to ask for it because the dept is tucked away in a back corner at our location. Hope this helps, it’s gorgeous and made for a beautiful party! It’s called Sofia fabric and I just found it in the last chances up to 50% off. 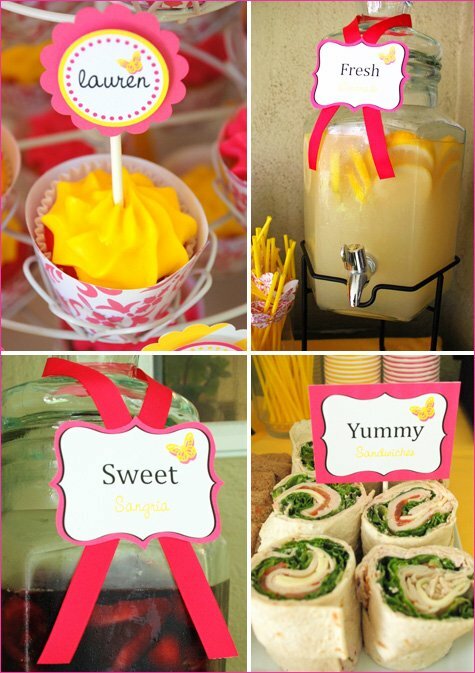 I love this theme party, I am planning my baby’s first birthday for June and I think the colors are perfect for summer. I would like to know where can I find those cupcakes wrappers? love them! Thanks you did a great job. I love this party! Where can I find a great lemonade like the one in your party? very nice indeed and love the bright colors!!!!!!!!!!!!!!!!!!!!!! i have tried to find yellow stripe fabric to no avail. where did you get the tablecloth?? 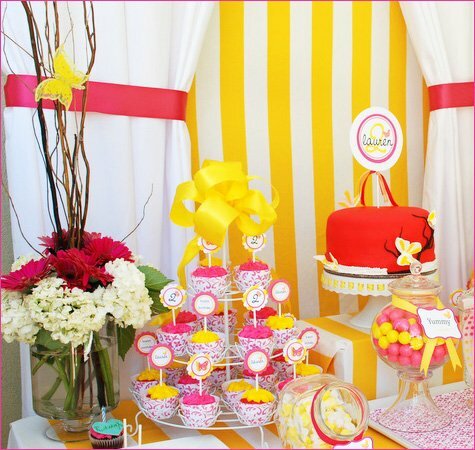 So cute I need to know where I can buy the Yellow and white striped table cloth? So cute Where can I buy the Yellow and white striped table cloth?